This winter, University of Lynchburg Theatre students bring classic fairy tale characters to life with an innovative twist on the Stephen Sondheim musical Into the Woods. Performances will be held in Dillard Fine Arts Center Theatre at 7:30 p.m. Thursday through Saturday, February 22 through 24, and at 2 p.m. on Sunday, February 25. Buy tickets here. The play is a “quest musical” in which Cinderella, Little Red Riding Hood, Rapunzel, and The Baker journey “into the woods” to fulfill personal wishes, said director and theatre professor Jeff Wittman. Lynchburg’s rendition will begin with three explorers who travel to a deserted library, where they find a storybook containing all of the classic fairy tale characters. The deserted library theme runs through the set and costumes as well. “Some set pieces are made out of books and the tree leaves are bookmarks, which really unified our design,” Wittman said. The musical’s 23 cast members returned to campus early from winter break to jumpstart rehearsals with a theatre boot camp. “Having gotten a head start with boot camp at the beginning of this semester, I’m quite comfortable with where we are at right now and am looking forward to opening night,” Austin Candler ’20, who plays The Baker, said. All told, about 60 people have worked for more than six weeks to bring the production to the stage. In addition to Wittman, the faculty/staff production team includes choreographer Loretta Wittman, set and lighting designer Christopher Otwell, and costume designer Savannah Ketchum. Theatre major Georgie DeCosmo ’18 described the musical’s score as “challenging” and said, “I’ve learned to push myself and step out of my comfort zone to explore new things with my character, the Baker’s Wife. Wittman said Into the Woods was chosen because of its relatability to people from age 10 to senior citizens — an audience that has likely, at some point in their lives, encountered the storybook characters. 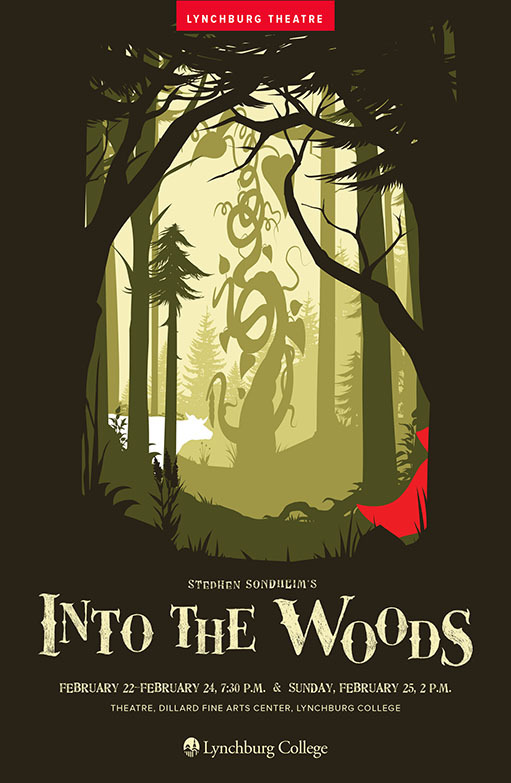 Into the Woods tickets, available here, are $15 for adults, $12 for age 60-plus, and $5 for students. For more information, call the LC box office at 434.544.8380.